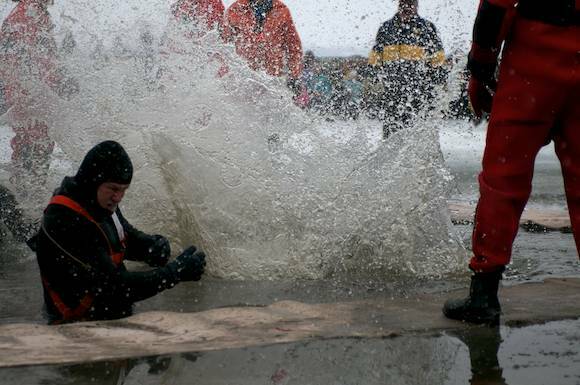 More than 100 people braved the chilly water today at Chemong Lake to take the Polar Plunge. Here are photos and an interview with one of the participants, Jay Scotland. Recently, PtboCanada had a chance to ask Jay Scotland a few questions about his annual dip in Chemong Lake. This is what he had to say going into his third year taking the plunge in support of St. John Ambulance and B.E.L. Rotary. PtboCanada: What's the last thing you do before taking the plunge? PtboCanada: And the first thing you do when you get out of the frigid waters? Scotland: I concentrate on trying not to make a stupid face...to no avail. PtboCanada: What have been your costumes over the years? Scotland: First year for me, I plunged as a hula dancer with a coconut bra and a grass skirt. Last year, I plunged as a part of an Olympic bobsleigh team. (We won best costume btw.) This year, I'll plunge as a polar bear [see his pics above], wearing a cape to conform to the Superhero theme. This was the 31st year for the B.E.L. Rotary Polar Plunge, which takes place at Chemong Lake in Ennismore. This year's event raised money to go towards local charities and organizations.